E-commerce is the buying and selling of product or service over electronic systems such as the Internet and other computer networks. E-commerce is a term for any type of business, or commercial transaction that involves the transfer of information across the Internet. Electronic commerce draws on such technologies as electronic funds transfer, supply chain management, Internet marketing, online transaction processing, electronic data interchange (EDI), inventory management systems, and automated data collection systems. Modern electronic commerce typically uses the World Wide Web at least at one point in the transaction's life-cycle, although it may encompass a wider range of technologies such as e-mail, mobile devices and telephones as well. 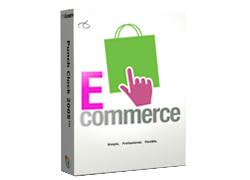 Electronic commerce is generally considered to be the sales aspect of e-business. It also consists of the exchange of data to facilitate the financing and payment aspects of business transactions. It covers a range of different types of businesses, from consumer based retail sites, through auction or music sites, to business exchanges trading goods and services between corporations. It is currently one of the most important aspects of the Internet to emerge. Ecommerce allows consumers to electronically exchange goods and services with no barriers of time or distance. KN Technologies offering e-Commerce websites and redesigning, KN Technologies will be a good partner for the needs in professional e-Commerce web design solutions. With Professionals under one roof, KN Technologies will provide you necessary design, development and marketing services that are the needs to be successful online. We know what it takes to get sales. With unlimited products and categories, to a secure one-page checkout, we make easy online shopping for customers and easy to manage for website owners.